The Baltimore Ravens were 0-1, having lost badly at Pittsburgh in Week 1, as they hosted the Cleveland Browns on September 14, 2003. Head Coach Brian Billick’s team was coming off a 7-9 record in ’02 with many first and second year players on the roster. Known for their solid defensive play, they were starting a rookie, Kyle Boller, at quarterback and were heavily dependent on RB Jamal Lewis to carry the offense. Lewis was two years removed from a torn ACL that had cost him an entire season, but he rushed for 1327 yards in 2002 and showed no ill effects from his knee trouble. The Browns, coached by Butch Davis, were also 0-1 after a low-scoring loss to the Colts. They had gone a surprising 9-7 in ’02 to reach the postseason. The team’s quarterback controversy had, at least for the moment, been settled with backup Kelly Holcomb starting ahead of the inconsistent Tim Couch. RB William Green led the running game and there was a good group of receivers. But the defense was in flux. There was a crowd of 69,473 in attendance at M & T Bank Stadium. The tone for the game was set on the second play from scrimmage when Jamal Lewis, showing off his breakaway speed to go along with his power-running ability, ran 82 yards for a touchdown. Following a punt by the Browns, Lewis took off for a 23-yard gain. The Ravens advanced to the Cleveland 26, converting a fourth down along the way, but Matt Stover’s 44-yard field goal attempt was unsuccessful. The Browns fumbled the ball right back and Baltimore went 45 yards in nine plays, the big ones passes from Kyle Boller to WR Travis Taylor for 19 yards in a third-and-10 situation and 26 yards to WR Frank Sanders to the Cleveland two yard line. The Browns stopped Lewis on three straight carries and the Ravens settled for a 20-yard Stover field goal. It was 10-0 in favor of the home team after a quarter of play. The teams traded punts as the game moved into the second quarter before Boller was intercepted by FS Earl Little, who returned it 21 yards to give the Browns possession at the Baltimore 21. They couldn’t move the ball but Phil Dawson kicked a 44-yard field goal to get them on the board. The Ravens responded with a scoring drive of their own that was keyed by Lewis blasting up the middle on the first play for 48 yards to the Cleveland 12. A penalty backed Baltimore up from there but they came away with a Stover field goal from 40 yards for a 13-3 lead. Following a short Cleveland punt, the Ravens gained just eight yards in seven plays but ended up with a franchise-record 56-yard field goal by long-range PK Wade Richey (it was Richey’s only field goal for the Ravens). That was it for the first half scoring and Baltimore went into halftime winning by 16-3. Notably, Lewis had already rushed for 180 yards. Neither offense was able to move to start the third quarter and traded punts, but one of them was returned for 44 yards by Baltimore DB Lamont Brightful to the Cleveland 26. However, the Ravens failed to capitalize when Boller fumbled and DT Orpheus Roye recovered for the Browns. Cleveland put together an eight-play, 62-yard drive that featured a pass from Kelly Holcomb to WR Dennis Northcutt for 27 yards. The series stalled at the Baltimore 17 and Dawson booted a 35-yard field goal to make it a ten-point game. A short series by the Ravens resulted in a punt, but the teams quickly traded turnovers. With Boller out of the game with a knee injury, new Ravens QB Chris Redman fumbled to give the Browns the ball at the Baltimore 22 and they scored in five plays that were capped by Holcomb tossing a five-yard touchdown pass to WR Kevin Johnson. Dawson converted the extra point and Cleveland was now just three points behind at 16-13. However, on the first play of the fourth quarter, Lewis made another big run, going 63 yards down the middle for a TD. Stover’s PAT gave the Ravens a ten-point margin once again. The Browns reached the Baltimore 45 on the next series and had to punt, pinning the Ravens back at their eight. While Lewis had a 19-yard carry around end, Baltimore again had to kick the ball away. Time was now working against the Browns and, while Holcomb threw two completions, they couldn’t get beyond the Baltimore 38. An incomplete pass setting up a fourth-and-two situation was followed by a sack of Holcomb that lost 13 yards and gave the Ravens the ball back on downs. Lewis carried four times and FB Alan Ricard contributed a 30-yard run as the Ravens went 38 yards in eight plays. Stover capped the series with a 21-yard field goal that made the tally 26-13 with less than two minutes remaining. The game ended with SS Ed Reed intercepting a Holcomb desperation pass and returning it 54 yards for a touchdown. What had for a time been a close game ended up being a 33-13 win for Baltimore. 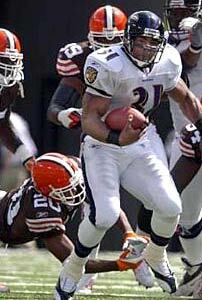 With his many long gains, Jamal Lewis set a new NFL single-game rushing record with 295 yards on 30 carries that included two touchdowns. As a team, the Ravens set a franchise mark with 343 yards on the ground, part of a total of 393 yards of offense in comparison to Cleveland’s 175. Baltimore also had the edge in first downs (14 to 9). Each team turned the ball over three times. Beyond the huge performance by Lewis, which broke the record of 278 yards set by Cincinnati’s Cory Dillon in 2000, there wasn’t much of a passing game. Kyle Boller completed 7 of 17 throws for 78 yards with no touchdowns and one intercepted, and in relief Chris Redman went to the air only once. Travis Taylor was the club’s top receiver with two catches for 27 yards. For the Browns, Kelly Holcomb was successful on 17 of 37 passes for 147 yards and a TD with two picked off. Kevin Johnson had 6 catches for 34 yards and a touchdown and Dennis Northcutt gained 62 yards on his 5 receptions. William Green led the running game with 54 yards on 17 attempts. It was all part of a season in which Lewis joined the exclusive 2000-yard rushing club with a total of 2066 on 387 carries (5.3 avg.) and 14 touchdowns. He was a consensus first-team All-NFL and Pro Bowl selection, was selected as the NFL Offensive Player of the Year by the Associated Press, and received NFL Most Valuable Player honors from the Pro Football Writers. His single-game record lasted until 2007 when Adrian Peterson of the Vikings exceeded it by a yard. The Ravens compiled a 10-6 record to top the AFC North. They lost to Tennessee in the Wild Card round of the playoffs. Cleveland had a disappointing year, going 5-11 and finishing at the bottom of the division. Jamal Lewis added to the misery by not only rushing for a record total against them, but when the teams met again in Cleveland he gained 205 yards, giving him 500 yards against one team in a season.